Obviously it's no reborn Grand National, but the Enclave is the right vehicle for the times. Something happened to Buick back in 2008 when the first and so far only generation Enclave crossover hit the market. That something was increased sales from people younger than age 65. Before this, Buick had tried to appeal to younger buyers with the so, so horrible Skylark coupe. But the three-row Enclave was very different and well-to-do suburban soccer moms quickly turned it into something trendy. The Buick Enclave has been so successful that aside from a 2013 refresh, it really hasn’t changed all that much in nine years. Inside and out, the design still looks fresh, especially compared to the smaller, yet boring looking Envision. 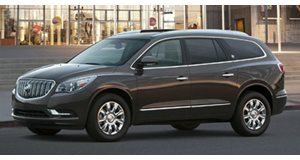 And because of its age and how Buick refined it over the years, the 2017 Enclave remains a smart buy, as we’ve recently learned. Powered by a 3.6-liter V6 with 288 hp and 270 lb-ft of torque, power is sent to either the front or all four wheels through a six-speed automatic transmission. Despite being heavier than most of its current competitors, the Enclave still manages to return a respectable, though not outstanding, 17/24 mpg city/highway. But perhaps one of the Enclave’s most attractive features is, like its previous generation Chevrolet Traverse and GMC Acadia corporate cousins, the usable third-row seat. Adults human beings can actually fit back there fairly comfortably, an issue that still plagues many new three-row crossovers today. Special thanks to Woodland Motors for letting us film the car. The Buick Enclave is very comfortable, but could do with a bit more power.